If you are reading this, then in some shape or form, you've considered running a 5k. Perhaps it's an "out there" goal that you've vocalized and you are working toward. Perhaps it's a secret ambition that you are too afraid to admit to even yourself. Because once you admit it, it will nag at you and you have to face the reality of making it happen. First, let me say ROCK ON. There was a time in my life (perhaps in 5th grade when I "ran" the Presidential Fitness Test 1 mile run in 32 minutes) that running more than a few feet seemed like an impossibility. I struggled with asthma and generally being not physically fit. But a few years ago I first achieved my goal of running a 5k. So I'm saying this: if I can run a 5k, you can run a 5k. Now, I'm not a doctor or a running coach. And, sure, there are medical exceptions to this assertion. If you have health issues, definitely talk to your doctor before taking up with training for a 5k. Whether you are in good physical condition or in need of working on your fitness level/new to running, the tips I am about to share are universally true. They are tips that Today Steph would have told 3 Years Ago Steph when she ran her first 5k. They are the same pieces of advice that I follow when running 5k's today. Again - as I'm not a medical or athletic professional, this advice is coming from a place of "Hey, dude. I'm your friend and I run, so here's my two cents." This is important. Because if running is relatively new to you, you need to work your body up to being in the condition of running a 5k. And for those who have the ability to run or run on a semi-regular basis, training helps to improve your ability, allowing you to perform better. Either way, a training routine/schedule is a safe way to get ready for your race (and helping you to avoid injury). For those who are new, I highly recommend the Couch 2 5k Program. It gently eases you into running. The C25K app starts with alternating between running and walking, increasing the time you are running over time. Note: Training schedules usually last 6-12 weeks, depending on the method and level. Choose a race a few weeks out so you can aptly complete a training routine. I know, this is my advice in every running post I write. But I can't stress it enough: good running shoes will make or break you as a runner. Rather, it will keep you from breaking as a runner. I had one experience injuring myself due to worn out shoes, and I learned my lesson! Go to a local running store (if you are in the Philadelphia area, check out Chester County Running Store!) and ask to be fitted. Most people who work at running stores are experienced runners, who can look at how you run on your feet, your gait and how you wear out the soles of your shoes to make sure you are in a shoe that supports you in the best way. Again, part of my standard advice. But I do not mean during the day of the race. I meant get into a regular routine of hydrating daily. When you run, work in electrolytes. My body responds better when it is hydrated. Conversely, when I slack on hydrating, my body responds adversely. Which is not fun to experience on the race course. 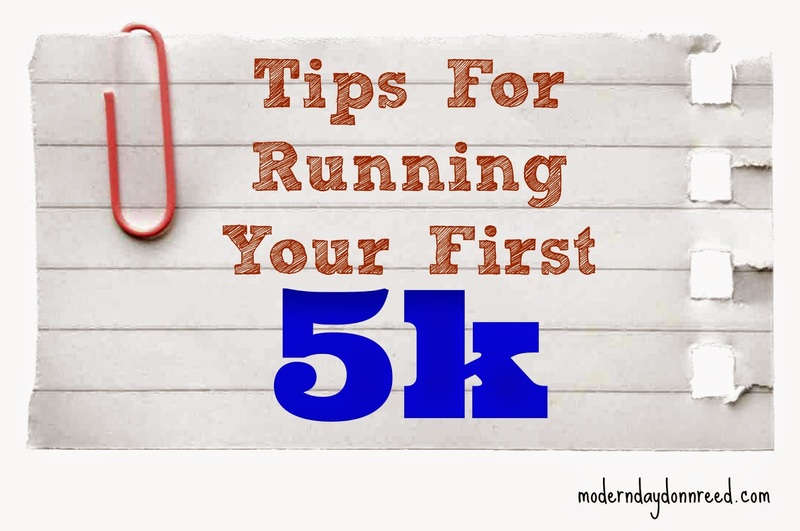 If this is your first 5k, I'm going to put it plain and simple: your goal is to FINISH. I don't care if it takes you over an hour. Don't try to be all zippy and finish quickly. If you've never raced before, you most likely won't be winning any medals or awards. And that is okay! Even after running regularly for several years, I'm not quick and I'll never place in a race. But during your first race, don't worry about how fast your pace is, don't worry if you are "behind the pack." Your goal was to run a 5k - and that's your job on race day. Running. A 5k. Just make that happen, and you can create more specific pace-related goals in the future. If you're a more experienced runner, consider challenging yourself. Choose a finishing time that isn't unreasonable, but slightly out of your comfort zone. Take this into consideration when you choose your training schedule. This is just a personal preference. I find local races to be smaller and less intimidating. Races in the metropolitan areas attract throngs of people, and it's wall-to-wall runners of all abilities. If it's your first race, aim for small. Your local running shop most likely helps host local races (or can at least point you in the direction to a local race calendar). The other great thing about participating in small, local races is that they are usually benefitting local charitable causes. So you can feel good about running! Races can be overwhelming for the first-time racer. It's nerve-wracking to get to the registration table and see the loads of people participating in the race. It's easy to think, "All of these people are better runners than me." And hands-down: it is intimidating to see the ultra-experienced runners. They still intimidate me, in their sleek gear and holding their nifty tech gadgets. They usually finish the race before I'm even a third of the way done. Know this: most people at races are most likely better runners than you. And me. Many are very experienced and racing so they can win the prize money. And guess what: no one is looking at you wondering why you decided to run a race. You know why? They are focused on themselves and their race performance. So take their cue and focus on YOU. Don't look around and let nerves and intimidation get the best of you. Just stay in your own little running bubble. Focus on keeping your breathing steady, focus on how your body is performing. Focus on achieving your goals. And focus on that finish line! Who will be running their first 5k this Fall? How can we encourage you? If you are a runner, what pieces of advice would YOU add to this list?